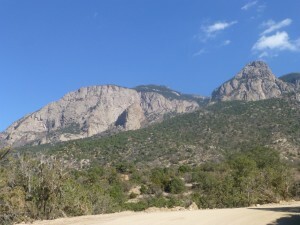 The Sandias are either a small mountain range or a large mountain rising 5,000 feet above Albuquerque in central New Mexico. 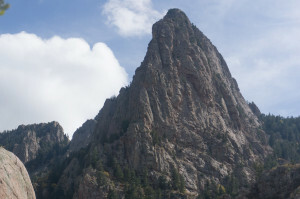 The steep western side features many trails for hikers and runners, and a wide variety of scrambling and climbing routes on its many fins and towers. 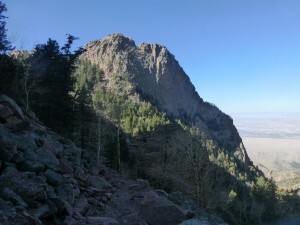 Sandia is thus an excellent “workout peak” in the spring and fall, when it is neither too hot nor covered in snow. 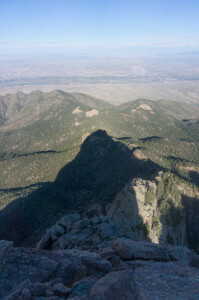 One of my favorite routes, which I have done several times, climbs the knife edge of the Shield (4th class), then descends the La Luz trail with a side-trip over the northwest ridge of the Thumb (5.4-ish). The route involves a bit under 4,500 feet of elevation gain, and can be comfortably completed in a short day (4h30 to 6 hours) when climbing unroped and jogging the descent. To skip the hardest climbing, or to shorten the outing, one can either climb up and down the Thumb’s southeast ridge, or skip it entirely. From Tramway Boulevard, drive up Forest Road 333 toward the La Luz trailhead, but stay straight on the dirt continuation of 333 for perhaps 1/2 mile to a large parking lot near a gate. Unlike La Luz, this lot does not require a day use fee (yay!). From the lot, hike along the dirt road until the Piedra Lisa trail leaves to the right. Follow this trail as it meanders up and down through several ravines, then climbs to a 7,600-foot saddle at the base of the Shield. 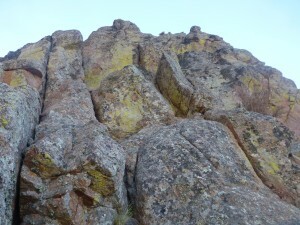 Leave the Piedra Lisa trail and follow a well-defined climbers’ trail east along the ridge, climbing through piñon and oak brush to the base of the Shield’s scrambling. Staying near the crest, most of the climbing is class 2-3. The crux is at and above the “W”, a double notch visible from the approach. When it is dry, one can easily jump across the first notch and hand-traverse the second; snow can complicate things a bit. Above the “W”, more 4th class climbing leads to easier terrain, where another use trail follows the crest and north side of the ridge over the summit of North Sandia to the Crest trail. From the intersection with the Crest trail, a pleasant, rolling run/hike leads to the parking lot and gift shop at the crest. While there is water available, it is all trucked in, so you have to ask nicely for it, and should probably only do so in an emergency. The La Luz trail leaves the Crest trail at the south end of the gift shop, and descends past the Thumb along the south side of La Cueva Canyon in a series of maddeningly flat switchbacks. Once below the stairs, look for a use trail leading from the north end of a switchback to the old trail in the center of the canyon. This route saves quite a bit of distance and time, and avoids numerous annoying talus-field crossings. To reach the Thumb’s northwest ridge, leave the (new) trail at the end of the last switchback before it crosses La Cueva Canyon. Alternatively, get back on the new trail from the old where the two nearly join, and leave it at the next switchback. If you are in the right place, you will pass some old fencing, then ascend a treed bench on a climbers’ trail to reach a ledge at the base of the route. The first two pitches are probably the hardest, so if you’re comfortable at first, you should be fine with the rest of the route. An optional crux higher up, marked by an old ring piton, can be bypassed by traversing left, then climbing up and back right to the ridge crest. Eventually the climbing eases off, with lots of class 2-3 scrambling leading to a final 4th class headwall just below the summit. To descend, follow the cairned route along the southwest side of the southeast ridge until it reaches a saddle. From here, follow bits of use trail straight down through the woods on the left side of a talus field, then cross it and descend the woods on the other side to pick up the trail. Rather than following the meandering new trail, it is much more pleasant to continue along the old trail below where the new one crosses La Cueva Canyon, passing through a nice aspen grove before climbing slightly to rejoin the new trail near a minor saddle. From here, put on some music to pass the time on the maddeningly flat switchbacks back to the La Luz trailhead, then walk the road back to the Piedra Lisa trailhead. It’s definitely easier if you go around to the left/north, though there’s quite a bit of rock lettuce. I don’t know what YDS grade it is, but it didn’t feel harder than the initial moves off the ledge.